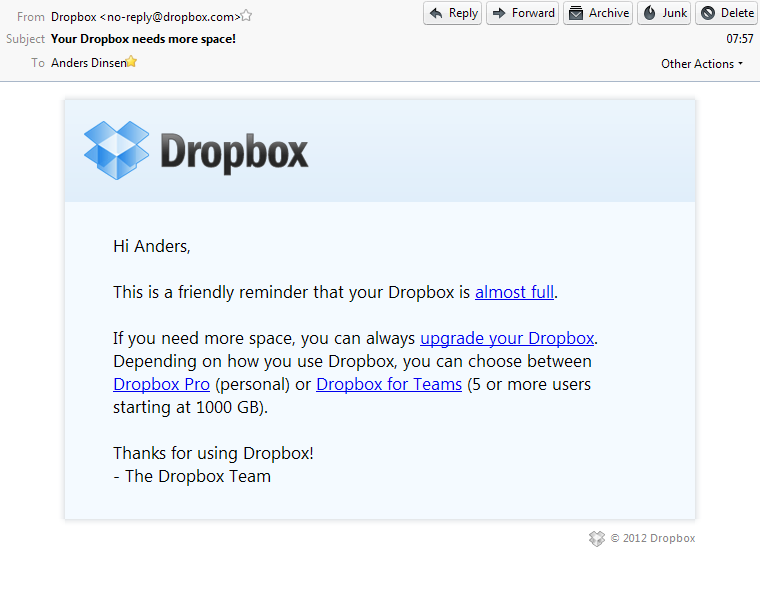 Dropbox is sending users e-mails like the one below. But there’s a problem: My dropbox is not nearly full. It seems Dropbox is including files in other peoples folders which have been shared read/write with me in the calculation of how much space my files are taking up. This is obviously a bug. Or is it? Dropbox is marketing their service as a file sharing service, and they’re encouraging users to use it to share photos and other stuff with friends and relatives. This marketing is paying off: Users are signing up like never before (I know that because I see more friends signing up). As new Dropbox users start sharing files with me, the amount of space remaining on my Dropbox account is reduced. Essentially they’re asking me to pay for other users’ files. There’s an alternative, though: I can earn space by asking others to sign up, thereby accelerating the problem. I’m sure this is going to earn Dropbox a lot of revenues, so it should probably be counted as a feature. I’d call it a buggy one, since users will notice, and I’m sure this will kick back on Dropbox. I don’t remember who said it, but it’s still true: If you’re offered something for free on the internet, then that something is not the product. Then you are the product.